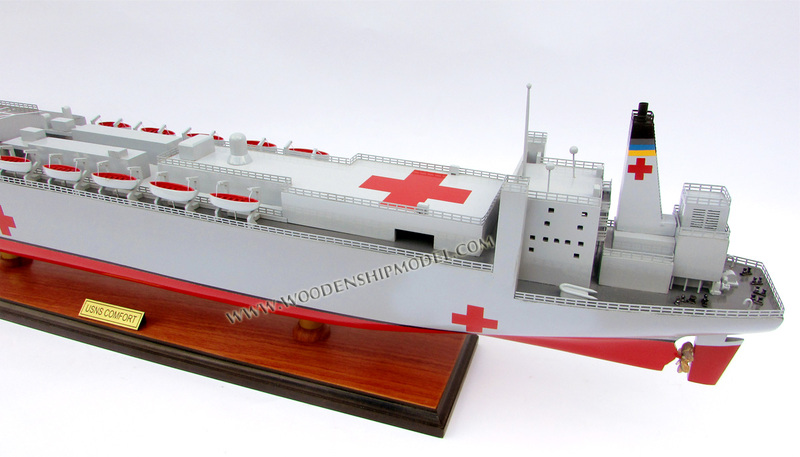 This war ship model is all hand-crafted from hard wood with planks on frame construction and painted as the real ship. There are no plastic and this model is ready for display. 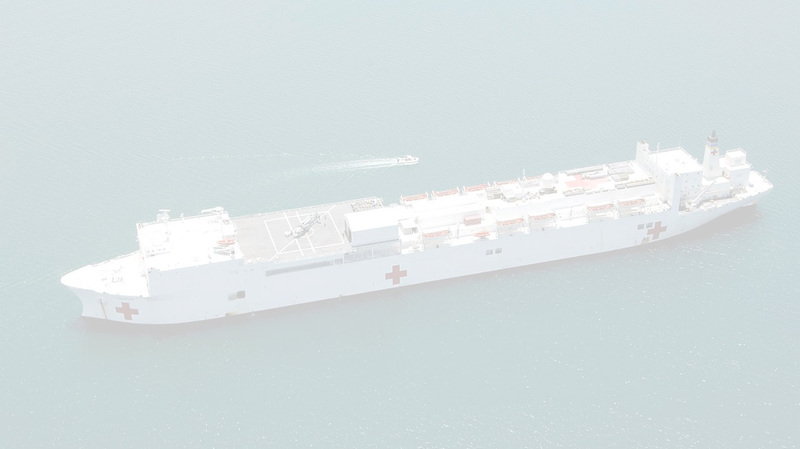 USNS Comfort (T-AH-20) is the third United States Navy ship to bear the name Comfort, and the second Mercy-class hospital ship to join the U.S. Navy's fleet. 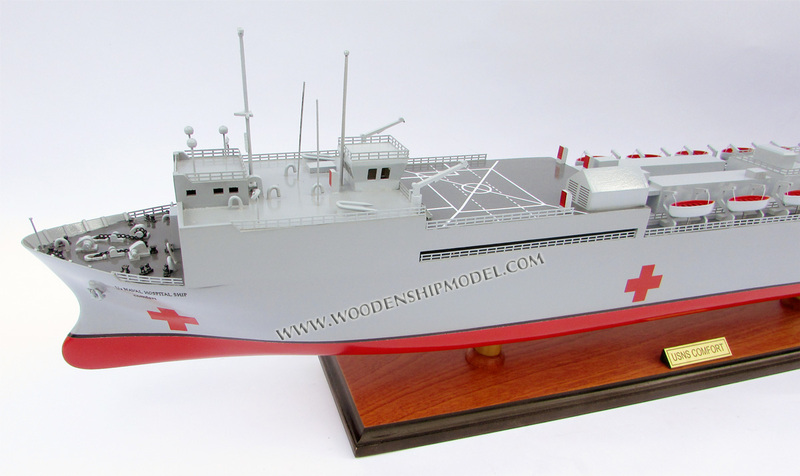 The USNS prefix identifies the Comfort as a non-commissioned ship owned by the U.S. Navy and operationally crewed by civilians from the Military Sealift Command (MSC). A uniformed naval hospital staff and naval support staff is embarked when Comfort is deployed, said staffs consisting primarily of naval officers from the Navy's Medical Corps, Dental Corps, Medical Service Corps, Nurse Corps and Chaplain Corps, and naval enlisted personnel from the Hospitalman rating and various administrative and technical support ratings (e.g., Yeoman, Personnel Specialist, Information Systems Technician, Religious Program Specialist, etc.). In keeping with her status as a non-combatant vessel, naval personnel from the "combat" specialties are not assigned as regular crew or staff. Underway embarks by Navy Unrestricted Line officers (e.g., warfare qualified combat specialties), enlisted Naval Aviation, Surface Warfare, Submarine Warfare, Special Operations or Special Warfare/SEAL personnel, or any Marine Corps officers or enlisted personnel, are typically limited to official visits, helicopter or tilt-rotor flight operations or as patients. In accordance with the Geneva Conventions, USNS Comfort and her crew do not carry any offensive weapons. Firing upon Comfort would be considered a war crime as the ship only carries weapons for self-defense. 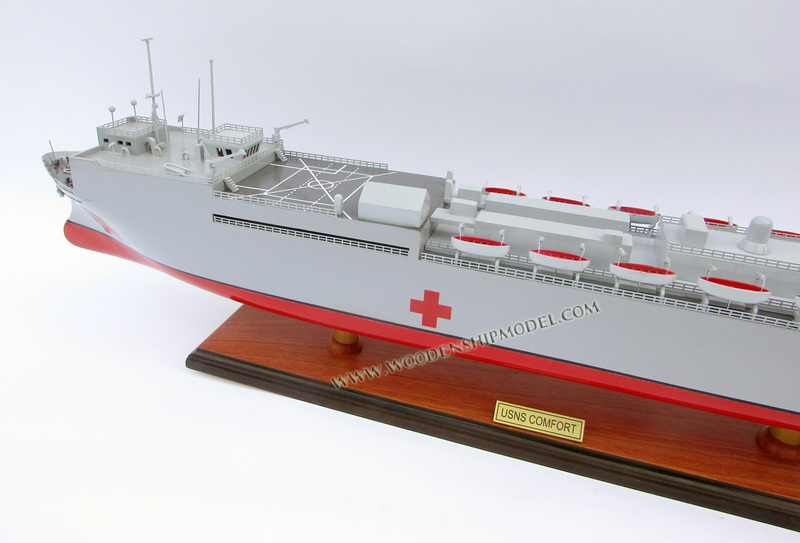 Like her sister ship USNS Mercy, Comfort was built as a San Clemente-class oil tanker in 1976 by the National Steel and Shipbuilding Company. Her original name was SS Rose City and she was launched from San Diego, California. Her career as an oil tanker ended when she was delivered to the U.S. Navy on December 1, 1987. 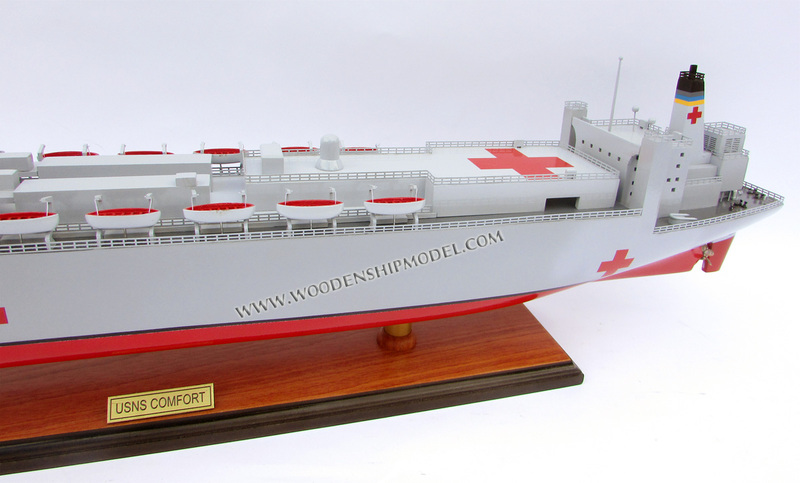 As a hospital ship, Comfort's duties include providing emergency, on-site care for U.S. combatant forces deployed in war or other operations. Operated by the Military Sealift Command, Comfort provides rapid, flexible, and mobile medical and surgical services to support Marine Corps Air/Ground Task Forces deployed ashore, Army and Air Force units deployed ashore, and naval amphibious task forces and battle forces afloat. Secondarily, she provides mobile surgical hospital service for use by appropriate U.S. government agencies in disaster or humanitarian relief or limited humanitarian care incident to these missions or peacetime military operations. Comfort is more advanced than a field hospital but less capable than a traditional hospital on land. After a quarter-century in Baltimore, Maryland, USNS Comfort changed her homeport to Naval Station Norfolk in Norfolk, Virginia in March 2013. The move placed the ship closer to supplies, much of which come from Naval Medical Center Portsmouth, and to medical crew. Savings to the U.S. Navy are estimated at $2 million per year.